Test strip for blood glucose measurement in venous, capillary, arterial and neonatal bloods. Suited for both personal and professional use. Needs a small drop of blood (only 1 microliter) for the test and has a vacuum system. With this process, the measurement of glucose becomes practical, rapid (10 seconds to result) and has no need for a second drop of blood, making the collection and the test easy. The blood can be collected from the finger and in the palm or forearm. The test strips have a protective PVC film to protect the reagent area. It has three electrodes that minimize any interference in the results. The maximum time to show the result is 10 seconds. 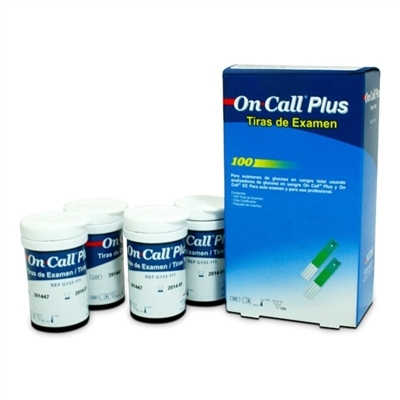 On Call Plus test strips comply with all worldwide standards and manufacturing techniques, and precision within the range established for all manufacturers in the world. A new vial of test strips can be used for three months after being opened for the first time. The professional use of individual test strips reduces by 18% the hospital costs. Simplifies the operation, controls the use and increases the effectiveness of recovery from paying agents.